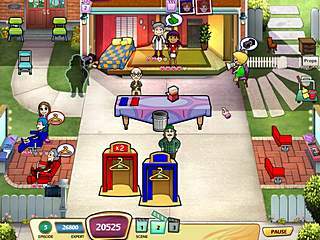 The feature of the game is that Soap Opera Dash a little bit reminds of the Sally’s series. The game consists of 50 levels in every of each Rosie needs create a different number of scenes. 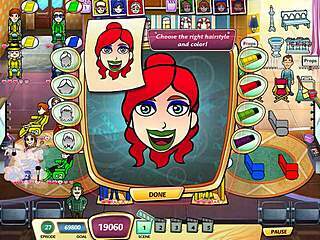 The feature of the game is that Soap Opera Dash a little bit reminds of the Sally’s series. While characters, color-matching and chaining bonuses are the traditional things taken from the dash series, some mini-games and dragging the heroes from one station to another reminds a lot the peculiarities of the Sally’s games. The goal of every level is usual – to earn as many points as possible. Every action will make your goal closer to you. As I’ve already mentioned, you’ll face rather diverse tasks. Apart from preparing the actors for the shooting that includes your fast-paced work at the hair styling stations, make-up stations and fitting rooms, you’ll have to take care of the hungry actors and even those of them who actually lack some acting abilities. In this concern you’ll move fast brining the hamburgers and … onion! Didn’t you know that a piece of onion can simply improve the actor’s ability to demonstrate the real dramatic skills? Fortunately a bar at the top of the screen will simplify your job by indicating the actor that has to be shot next. If you see an actor surrounded by stars get prepared for a mini-game. Actually all of them are not at all challenging – all you have to do is to put some lipstick of a specific color or choose the appropriate outfit. Though there are some components that will considerably complicate your progressing through the game. From time to time a movie critic might appear. But all that he needs is a hamburger. But you’d better give it to him as quickly as possible. Some fans might come in order to get the autographs. And of course all those people will make the set dirty. Try to guess who is to clean everything before the next scene will be shot! And that’s not talking about the stations that get broken… Filming is not only about finding the actors and getting them prepared! 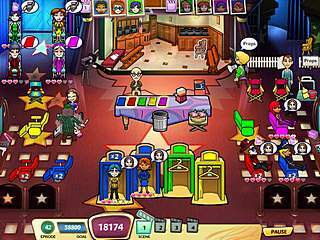 Soap Opera Dash differs from the other games of the series with its upgrade system. As you will quickly understand succeeding the levels, the upgrades are the same in all the locations and they don’t really play the big role for the game progressing. You can improve the stations or increase Rosie’s speed but Soap Opera Dash is even more about chaining and color-matching. So you can earn more points by paying your attention to these aspects of the game. The proven dash formula has been slightly changed in Soap Opera Dash. And I think that worked very well. The game might seem too easy for the Time Management guru, but it is a nice chance for those of you who have always treated this genre cautiously. This is Soap Opera Dash review. Download this game here.